Gal pal tipped me off on these darling Kate Spade bags since SG is a total bag lady. Anyhoo, if you are not keen on spending thousands on a Chanel quilted 2.55 tote, this Kate Spade tote is stylish and wallet friendly at $445. It is made of pebble leather which is more scratch resistant. I adore all my Chanel lamb skin bags but I use caviar (or pebble) leather more often because lamb leather is easily scratched if I as much look at it the wrong way. This tote offers simple silhouette but the quilted design and chain straps make it far from boring. I can see a gal will adore this tote for years to come. What do you think? I love Kate Spade so much ! thats a great tote,love that kate spade has such an elegant design style too! I was just looking at these last night. I love the classic shapes. Kate Spade has done such a good job lately. wow i like kate spade ! nice bags and not as expensive as chanel . haha . I loove the silver Chaneç! I know some girls that really love Kate Spade. Her bags do look nice. This is a great alternative to Chanel, especially if you don't have the funds or need a bag you won't have to baby. I also love the fact that it's fairly basic. 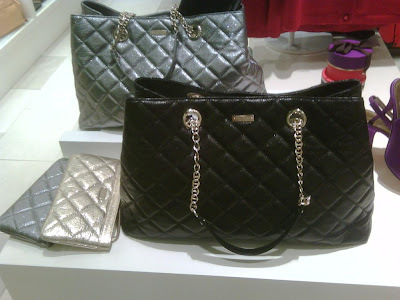 Other quilted ones, such as the Marc Jacobs version are too heavy and have too much going on. love it! Definitely a great alternative to the chanel. I love these. I have always loved Kated Spade, though. I think I love this bag. Chanel is not an option for me at this point. Kate Spade is more my price point and this is a piece that could really endure. I think it's a very good option insted of Chanel 2.55 ;) It looks so nice!! Oooh that is so cute! But I am afraid anything over $50 for a bag is not something my husband would agree with, lol. Hi there-I really like this bag, its a fabulous, classic design and a great compromise on a 2.55!! I will definitely buy this... a great Chanel substitute. And it's Kate Spade. Thanks for sharing this. Oh, the quilted bags! Aren't we all crazy about them? Those are beautiful! A great alternative to the Chanel ones! i love them! both the gray and black are lovely, wish i had them. you are right, the chain straps gives these quilted totes a boost in chicness. just learned something too, gotta pay more attention to the type of leathers, didn't know one was more scratch resistant than the other, thanks. it is true what they say, you learn something new everyday. Oh yeah, I like! Awesome alternative to the 2.55. I love it and think it's going to have to go on the wish list! I love Kate Spade!! This bag is too cute! Ahhh what a great find!! I think it's going on my Christmas list! SO CUTE!!! That's a *beautiful* alternative! I love the white and pewter. so cute, but it's not wallet friendly for me. ough!!!!!!!!!!! it's very pretty and the price is right, though I would save and put it towards the chanel! They're cute, but so Chanel-like it would just look like you were trying to cheap out on Chanel :( It's too bad b/c they really are quite nice and more practical too.